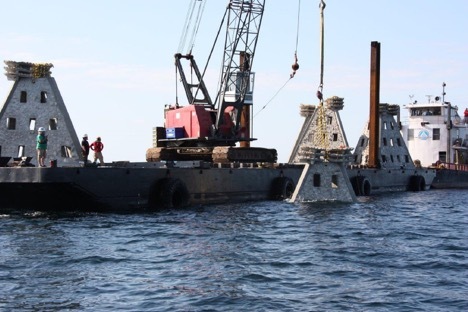 Earlier this year, Bay County completed an artificial reef project in Gulf waters approximately 3 nautical miles (nm) south of the Panama City Beach Pier (Pier Park) and 11 nm west of St Andrew Bay Pass in Small Area Artificial Reef Site D. On May 14, five Super Reefs were deployed, each weighing approximately 36,000 lbs and rising 18 feet from the ocean floor. 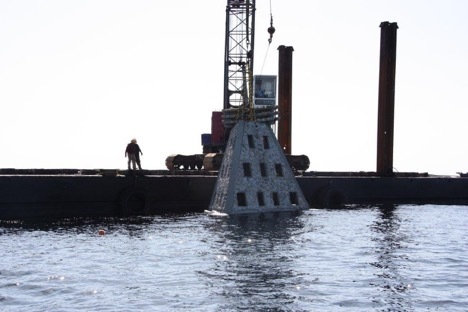 Typical artificial reef modules are only about 8 feet tall. 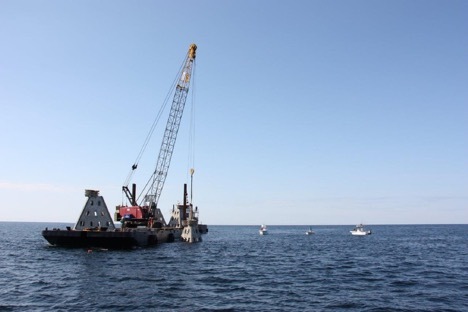 This was the first time Super Reefs were deployed in western Bay County in the Panama City Beach area. 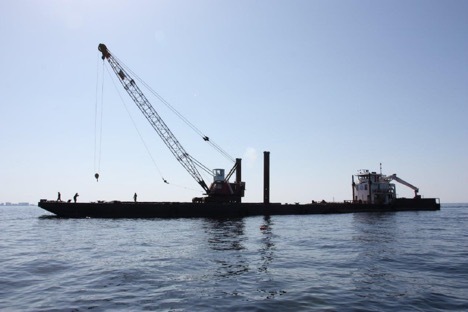 The project provides marine habitat comparable to sinking a large vessel. Previous monitoring and research suggest it takes 3 to 5 years for new reefs to reach full development of the associated marine ecosystem. Bay County will work with local anglers, divers, reef associations, and agencies to evaluate the performance of the new reef materials and the reef design. 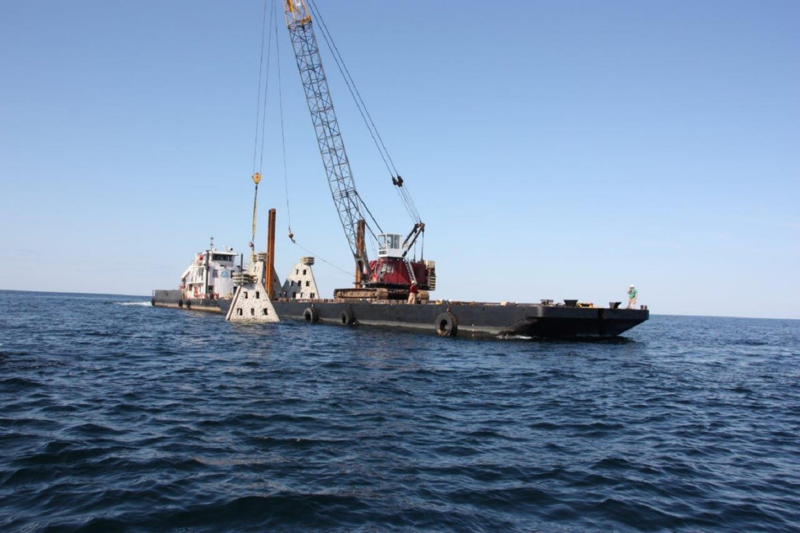 Bay County artificial reef projects seek to use material that meets program goals and objectives. In this case, larger reef materials were selected to support larger reef fish such as amberjack, grouper, and snapper. Individual reef modules were spaced to support fish forage areas and accommodate multiple users including anglers and divers. Funding for this $60,000 project was provided by Florida Fish and Wildlife Commission’s Artificial Reef Program. 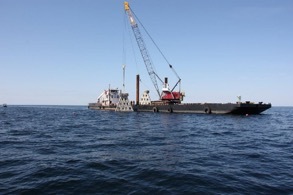 Additional reef projects were deployed by the Mexico Beach Artificial Reef Association earlier in the week. The Bay County Artificial Association (BCARA) is also planning new reef deployments in Bay County. Learn more about Bay County’s public artificial reefs at http://x.co/reefm. Florida Sea Grant hosts a Facebook page focused on news and information related to Florida’s Artificial Reefs. 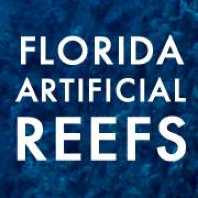 You can visit the page for latest information from around the state at https://www.facebook.com/floridaartificialreefs. 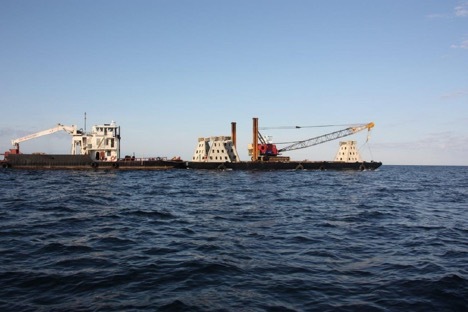 Walter Marine’s Maranatha deploying one of the five Super Reefs placed 3 nm south of Pier Park. The Super Reefs weigh more than 18 tons and are 18 feet tall. 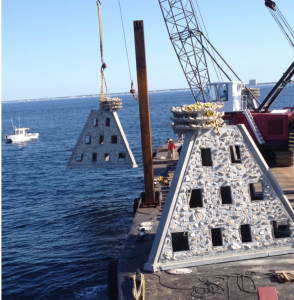 Photo by Bay County Artificial Reef Coordinator, Allen Golden.